William C. Folger after Solomon Coffin and Daniel Allen, [docketed:] Foot of the Plains [:] Plat of Lower Plains copied by W.C. Folger from the original plat 1855. Nantucket, 1855. Manuscript in ink on a sheet of crude brown paper, 25 ½”h x 20”w at sheet edge. Some wear at edges, but clean, good overall. A rare 19th-century manuscript survey recording the division of common lands in the Lower Plains at the western end of Nantucket, a process as controversial as it was important. In the 17th and 18th centuries the “Common and Undivided Lands of the Proprietors of Nantucket” were inviolable, set aside for grazing sheep, cattle, and horses; for gathering wood and peat; and for communal agriculture. Owning a “Sheep Commons” at that time meant having the right to pasture one sheep on the common lands. (8 Sheep Commons = 1 Cow Commons; 2 Cow Commons = 1 Horse Commons). This state of affairs continued well into the 19th century, well after most other Massachusetts towns had subdivided their common lands and distributed them among the citizenry. 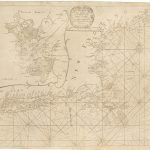 An exception was made for house lots in the town of Nantucket, beginning with the Wesco Acre Lots (1678), the Fish Lots (1717) and the West Monomoy Shares (1726). Each division was laid out into twenty-seven equal shares: one each for the twenty original proprietors, plus one-half each for the original fourteen half-share tradesmen. Those shares were apportioned among heirs many generations after the original Proprietors and Half-Share men had ceased to exist. Owners of portions of shares were free to sell to whomever they wished. 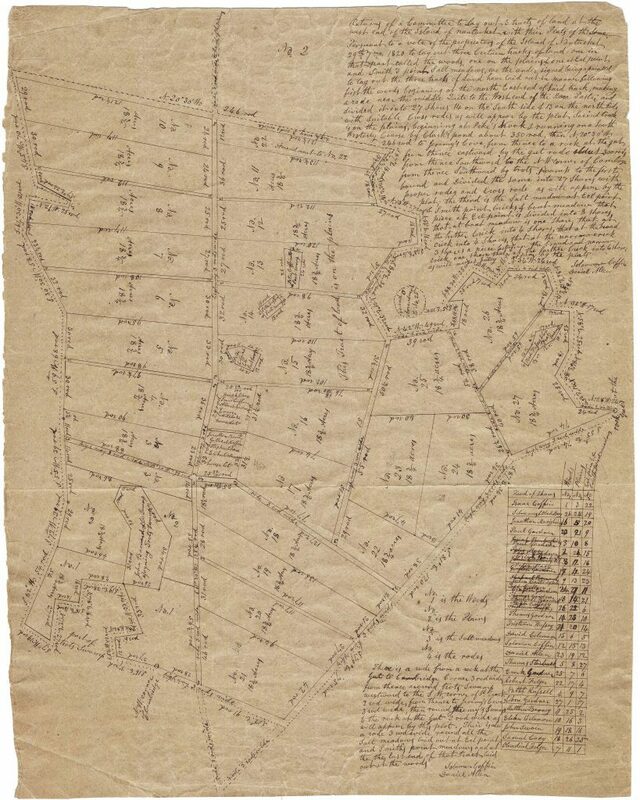 The intricacies of land transactions within the town were carefully described and recorded, but the boundaries of the outlying lands, the former commons, were much more difficult to accurately document. By the early 19th century, there was a movement among some of the Proprietors to divide and distribute the common lands so that each Proprietor could claim private property, fence it, and use it as he liked. Quaker historian Obed Macy saw this movement as the end of a way of life, of a “brotherly” sharing of property for the benefit of all. In 1811, Obed and his brother, Sylvanus, were the probable authors of a pamphlet published in Boston, titled “A Nest of Love Disturbed, or, The Farmer’s Dialogue,” wherein they lay out arguments for keeping the commons intact. They did not succeed in convincing the majority. The resulting “sheep wars” were eventually won by the wealthier proponents of private ownership, and the new rule was that any Proprietor owning a hundred or more Sheep Commons was eligible to have land set off to him. In 1820, the Proprietors voted to survey select areas of the commons, dividing each into twenty-seven equal shares. Offered here is a mid-19th century manuscript copy of one such survey, of common land in the Lower Plains (or “Planes”) area on the west end of the island just east of Long Pond. 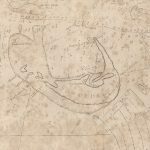 The survey was executed by islanders Solomon Coffin and Daniel Allen, and the original is in the Nantucket Registry of Deeds. The survey covered an irregular area very roughly 350 by 320 rods in extent, the equivalent of a square mile or so. One side of the parcel butts up against the east shore of Long Pond, from the Gut south to Jeremy Cove, then extends to the east for the better part of a mile. As usual with these surveys, the parcel has been divided into 27 lots of equal extent (in this case, 18 ¾ acres). Several roads are laid out, uniformly three rods wide, so that each lot has ample road frontage. Some of the lots appear to have been subdivided, while lot 22 is “amended” by a small lot at the top of the survey, presumably to compensate for some inferior land. At upper right is a long note describing the outer bounds of the parcel and of two other nearby parcels ordered surveyed at the same time. At lower right is a table listing the proprietors and the lots received by each. Among these are many descending from some of the earliest settlers of the island. Daniel Allen Jr. (1756-1843). Few documents remain to provide clues to the occupation and achievements of Daniel Allen Jr., aside from bills relating to driving sheep, marking sheep, and surveying. Records show that he made surveys with Walter Folger Jr. and his brother Aaron Folger, and that he was married to their cousin, Phebe Folger, with whom he had seven children. He and Daniel P. Macy surveyed a number of the 1821 divisions of common lands, and he worked with others to lay out town roads, and divide Tuckernuck Island. He appears to have been a trusted surveyor and draftsman. This survey originally belonged to a large archive of maps, plats and documents in the possession of Frank H. and Clara Low (1925-2016). Clara was the daughter of Henry Coffin Everett (1891-1963) and the great-great-granddaughter of Henry Coffin (1807-1900), one of the key figures of 19th century Nantucket. Henry built the house at 75 Main Street, across from his brother Charles G. at 78 Main. The men were in the whale-oil business together in the firm C.G. &H. Coffin. 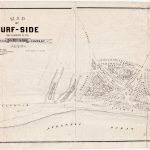 When that industry failed in the mid-19th century, they—along with Henry’s son Charles F.—were early developers of a plan for Surfside to become a summer cottage community that would rival Siasconset, a thriving resort on the east end of the island. Charles F. Coffin also created a development south of the village of ‘Sconset called Low Beach. Some of the surveys in this collection were drawn specifically for Henry Coffin Everett. Others not specifically surveyed for him, relate to areas of the island where he owned property that had descended to him from Henry Coffin— this included almost every part of the island from Madaket to Siasconset: Trotts Hills, the Plains, Smooth Hummocks, Surfside, Shimmo, Pocomo, Plainfield, and the Southeast Quarter. The various early surveys more than likely belonged to Henry Everett’s father, also named Henry Everett (1859-1945), and some date back to the original Henry Coffin. The collection represented a family’s real estate holdings in an era before the rampant development of outlying areas of the island that began in the 1980s. Clara Low was owner of much of the family property in the mid-twentieth century. She and her husband were involved in dozens of land transactions worth many millions of dollars. Much of this description is adapted from research performed by Betsy Tyler of Nantucket, who until 2016 held the Obed Macy Research Chair of the Nantucket Historical Association. An extended discussion of the Nantucket common lands is found in Henry Barnard Worth, Nantucket Lands and Landowners (Nantucket: Nantucket Historical Association, 1901), chapter 9.